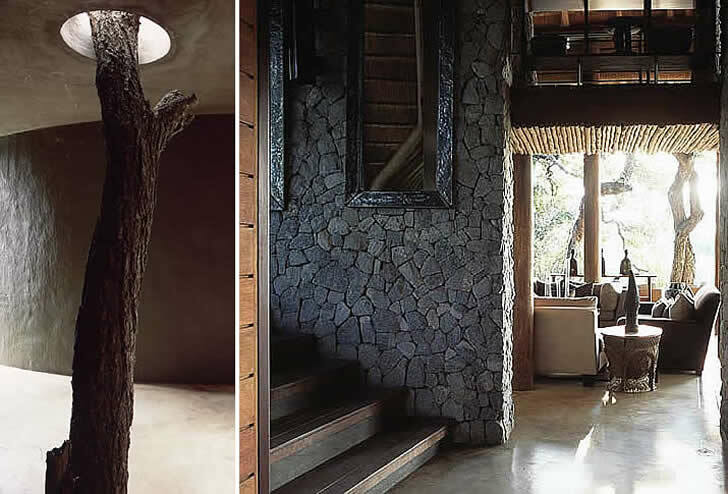 Leadwood Lodge boasts a tactile blend of boldly expressed and contrasted materials: crushed stone, raw cement, dark meranti wood, rough granite and glass. 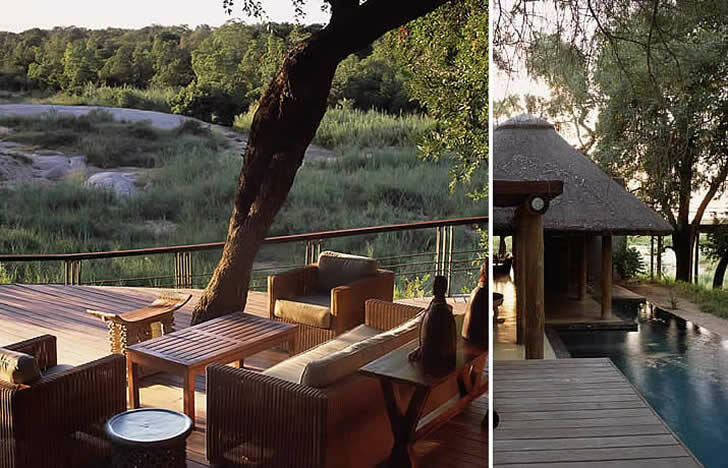 Exeter Leadwood Lodge is a beautiful and very private oasis in the western part of the Sabi Sand Game Reserve. The lodge overlooks the confluence of the Sand and Mabrak rivers, where colossal granite boulders rise dramatically from the riverbed and ancient leadwood and jackalberry trees form canopies of shade for the impressive range of birds and wildlife that frequents this extraordinary habitat. The building is a contemporary architectural vision rich in texture and patina and is experienced as a series of planes, steps and levels � a device that serves not only to emphasise the views, but also enrich the senses. In the public building a series of soaring spaces has been set on different planes to serve multiple functions: lounge, viewing areas, bar and restaurant. This unusual arrangement of space creates an atmosphere of sophistication and depth. The rest of the visual drama is achieved through the use of materials. Granite walls delineating the primary spaces make direct reference to the river bedrock. These are juxtaposed with more refined features of polished concrete, timber and glass, all of which impart feelings of lightness and modernity to this singularly confident construction. The double-volume nature of the spaces also �maximises the openness of the buildings on the riverside, enabling an increased degree of intimacy with the surrounding woodlands, all without losing the notions of security and comfort,� explains Plewman. Region-specific thatch serves to make the building merge respectfully with its surroundings. A discreet location and limited accommodation � there are only four suites � endear Exeter Leadwood Lodge to a privacy-seeking clientele. The suites as well as the main lodge fell under the interior direction of C�line Williams-Wynn, who has carefully selected the interior details to create a dialogue with the pared-down architecture. Her vision for the lodge stays away from traditional ethnic design elements, favouring contemporary colour combinations and glamorous decorative detailing instead. Rich browns are highlighted by vivid splashes of aquamarine or turquoise, and luxury finds expression in exotic fabrics such as crushed velvet, shot taffeta, heavyweight linen and silk, some embroidered with semi-precious stones and crystals. Pattern has been restricted to �that inspired by local artists,� says C�line, and only a small selection of indigenous objets � including painted and polished Bamileke and Ashanti stools � are used as display items. 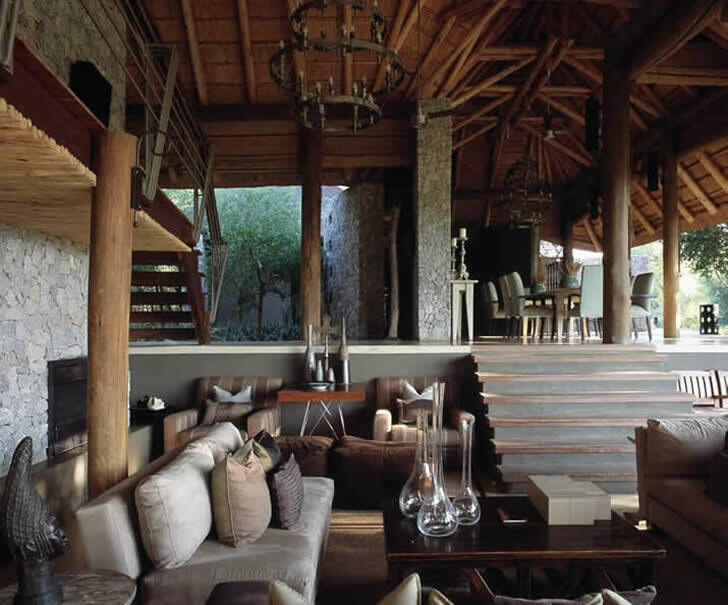 Exeter Leadwood Lodge is unique, says Nick Plewman, �because it eschews whimsicality in favour of a clear, unambiguously luxurious but thoroughly intimate experience of the wild.� In the individual suites, thatch, granite walls and large sliding doors create a rugged charm, but the feel is also reminiscent of an urban loft (a colour palette of cream, charcoal and cocoa reinforces this notion). Each suite features a centrally situated bed, desk/work station, sitting room and luxurious bathroom. 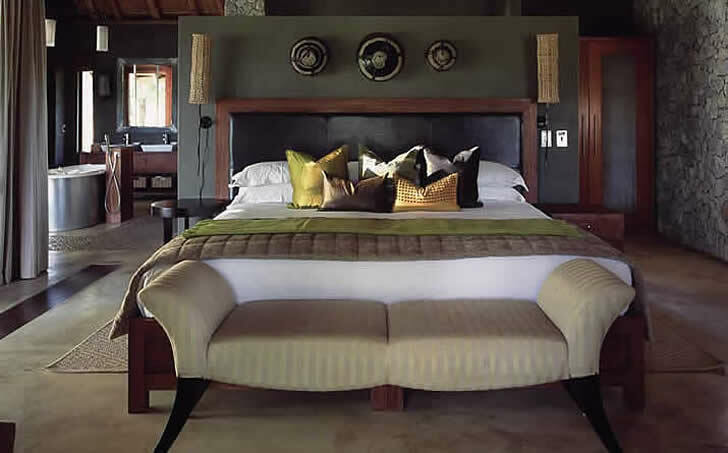 The suites also have their own private decks with plunge pools and are optimally positioned so that their occupants can, as Plewman and Conservation Corporation Africa intended, concentrate on enjoying their superlative natural surroundings.